Is my instrument as good as it could be? And if the answer to that question is not a resounding “yes”, then we might be able to help. Over the years, we at Plek have devised a way of measuring the curvature of the neck - known as neck relief - as well as the height and relief of the frets and the fret radius over the entire neck, all in microscopic detail. What are typical signs that my guitar needs help? Fret-Out: String tone dies away during bending due to unwanted contact with a fret. In general, if any of these issues apply, we can say that your instrument basically has poor playability due to a setup problem. But how do I get the best possible setup for my instrument? Basically, that depends on you. We see setup as the combination of string action adjustment, trussrod adjustment, and changes in the heights of the nut, bridge, and frets that are made to make the instrument as well--suited to the playing style of the individual player as possible. Individual setup totally depends on the playing style of the player. If, for example, you play with a lot of attack, you are going to need a higher string action to avoid buzzing than someone with a gentler style. You might ask yourself "Why should I go to a Plek center, rather than my local guitar tech?" To which we would say: Having a good guitar tech on hand is a wonderful thing. If you're happy with your guitar tech, then by all means stick with him or her. But a good guitar tech equipped with a Plek machine is a killer combination. 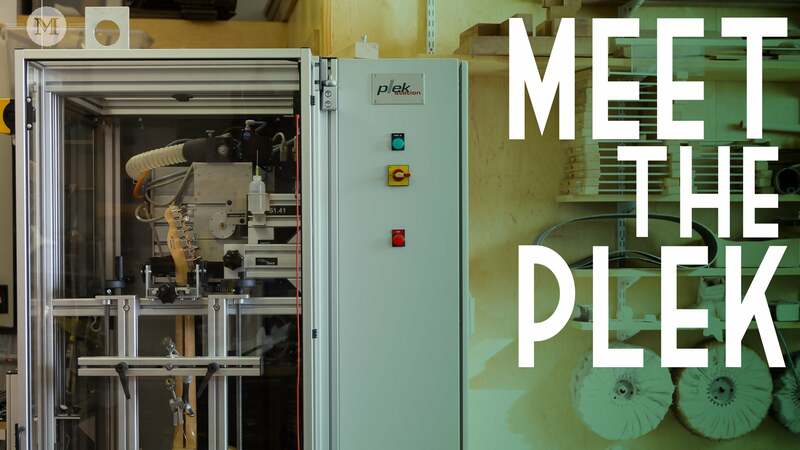 For guitar techs, a Plek machine is a tool that can take their skills to a whole new level, taking a lot of the effort out of fret work and raising the bar in terms of exactness and quality control. For you, the guitar player, having your guitar Pleked means that you can not only feel the improvements, you can also see the difference. In addition, you have a record of before and after. And you can repeat exactly that setup on a different guitar or again on the same instrument whenever additional work needs to be done. Before and after: What can I expect? The results of a Plek job really depend on the state of the instrument beforehand. On a cheap, poorly-setup instrument with substandard fretwork, the difference can be dramatic. On a good-quality instrument with a good setup, the results may be more subtle. Maybe you even have an instrument that was Pleked during production. Even here, a Plek job for your individual playing style and requirements can be a good idea, because no instrument factory can ever truly know the individual guitarist they are building for. So a Plek job can be a way of further personalising your guitar to your own needs. Once you have decided that you want to improve your instrument, you can take it along to your local Plek center for a diagnostic scan (or send it in, if there is no Plek center nearby). The scan will tell you, and the guitar tech, all there is to know about the issues your instrument has. Whether the trussrod needs to be tightened and by how much. Whether the nut and bridge need to be adjusted or replaced - overall or for individual strings. What the overall shape of the fingerboard is. What the neck relief is under each individual string, and whether it is as good as it could be. The height of the frets, and whether there are any potential buzzing issues. Whether the fret radius needs to be changed anywhere on the fingerboard. If there are buzzing issues, we can see how much fret material needs to be removed to achieve optimal playability. Or perhaps your frets are so worn down that they need to be partially or completely replaced. In addition, we can also try out various different fret dressing options and solutions in the safety of the software environment. This is known as a “Virtual Fret Dress”. This gives the Plek expert another opportunity to discuss the results with you, before he or she implements the changes that you decide on. The effect of all this work is like turbo-charging your fingers. Obviously, it's not like we can promise to make you a better player. Only hours of practice, dedication, and maybe a good teacher can do that. But what we can do is to remove some of the obstacles to your playing, and eliminate some of the things standing in the way of improvement. Where do I find my nearest Plek shop? The easiest way is to check out our World of Service world map, which lists all Plek service centers worldwide. Check out our introduction to our general-purpose integrated tool system for pro luthiers, the Plek Station. Want to get your instrument "plek'd"? Meet the Plek at Mass Street Music! Meet the Plek at Mass Street Music - home of great gear and exceptional repair work, in the heart of Lawrence, Kansas. Plek is now on Instagram. Our account is @getplekd, and we'll be regularly posting information about Plek technology.